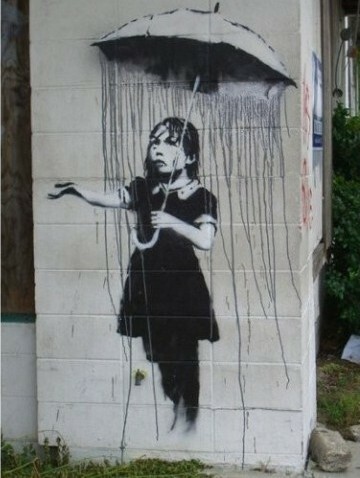 Find info on basement flooding risks and extreme weather at www.cityfloodmap.com. We maintain maps of Toronto flooding during historical extreme rain events (May 12, 2000, August 19, 2005, July 8, 2013). Reported flood locations are mapped at a local street level showing flood risk before sewer improvements - data can guide insurance coverage needs and identify private protection measures by owners, buyers and developers to limit flood damages and claims. Enjoy. R.J. Muir, Toronto, ON. 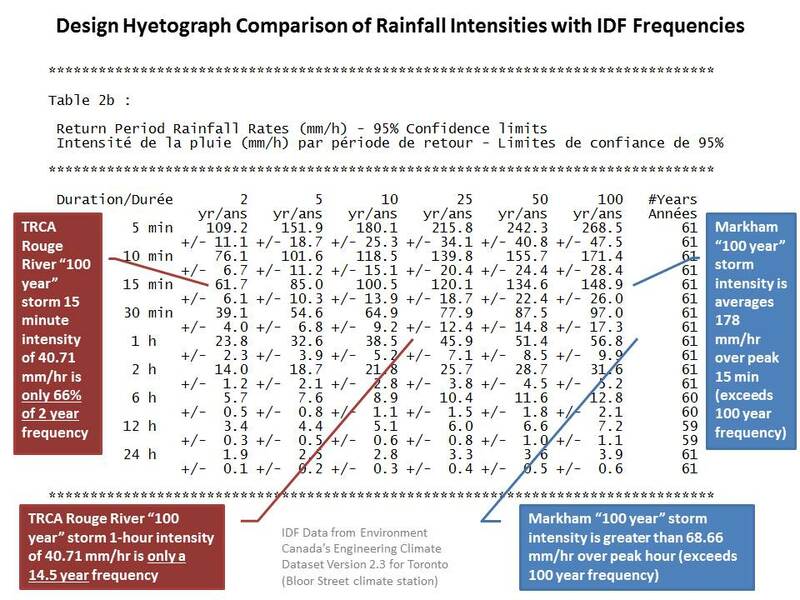 Intensity-duration-frequency (IDF) curves describe rainfall intensities used for drainage design. Sometimes the data are used directly as part of the Rational Method to calculate peak runoff rates at an instant in time. But such a simple application is rare as part of modern flood risk assessment and storm drainage remediation - in those more sophisticated applications, a temporal distribution of rainfall intensities is required to simulate the infiltration, runoff, routing, and storage processes in rural watersheds or urban drainage networks. The temporal distribution of rainfall - also called a hyetograph or design storm - is essential for deriving a times-series of flow (aka a hydrograph) or flood water levels in systems. So simple Rational Method calculations using IDF curves are to photos what robust simulations with hyetographs are to videos. Significant emphasis has been placed on updating IDF curves as a means of assessing climate change impacts to drainage systems. But less emphasis has been placed on updating the more critical hyetographs used in flood risk assessment and remediation. Why is that important? Because hydrologists can take the same underlying IDF data and turn it into either very conservative or unconservative design storms. That's right. While there are best practices, there are no rules for selecting the pattern, duration or peak intensity of design storms. To show this, below are hyetographs used for flood risk assessment and remediation design in a Greater Toronto Area (GTA) municipality. All of these are "100 year design storms", meaning they theoretically have a probability of 1% of being exceeded in any year. All have been derived by respected professionals, university professors, consultants and watershed managers at Ontario's best-funded and most advanced conservation authority. What do you notice? Different durations, vastly different peak intensities. Some design storms have been 'flattened out', averaging the peak rainfall intensity - the Rouge River floodplain design storm averages rainfall over the peak hour which essentially misses the critical short duration intensities that govern peak flood flows in flashy urban catchments. As shown below, flattening out hyetographs can turn a "100 year" storm into less than a 15 year storm for small, flashy watersheds. 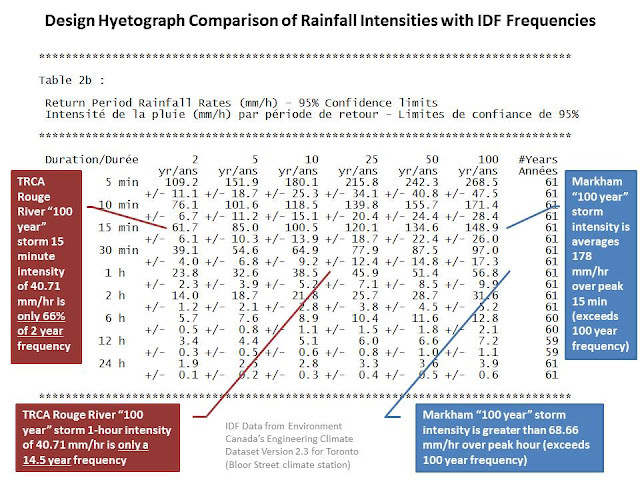 Design hyetographs can underestimate IDF data (Rouge Watershed "100 year" storm intensities are less than 15 year storm frequency for small flashy urban watersheds with times of concentration of 1 hour or less, based on Toronto IDF data), or can be conservative (Markham design hyetograph exceeds 100 year frequency for small watersheds). Question: What is the result of using different 100 year hyetographs? Answer: Vastly different runoff characteristics for any given watershed or catchment of course. Different 100-year design storms mean different hydrographs with different peak flows and different maximum flood levels in watercourses, storage ponds ... and potentially back-up in basements. In fact the 'low-energy' 100-year Rouge River 12 hour storm (aka the Jeb Bush) results in a peak flow similar to a 2-year storm using the 3 hour city design storm. In that storm the peak 5 minute intensity, peak 10 minute intensity, peak 15 minute intensity, peak 30 minute intensity values are lost / averaged out. As a result, in any simulation the calculated peak flows and peak flood levels are attenuated, underestimating flood risks and damage potential. You should ask: what is the net impact of updating IDF curves, e.g., increasing intensities by say 20% to reflect projected climate change impacts or tweaking intensities with other the best-fit extreme value probability curve-fitting, if you then average out those intensities in the hyetograph, cutting peak IDF intensities by 85% in the design storm, relative to raw underlying data? In the case of the Rouge River watershed storm, the net impact of increasing IDF values by 20% for climate change and then decreasing them by 85% is a net reduction in peak rainfall design intensity of 80%. It is likely that flood risks in urban watercourses are underestimated where attenuated hyetographs are used. Similarly, the flood elevations at storm sewer outfalls (aka 'tailwater' in the storm sewer network) that could indicate back-up risks for upstream connected basements are also understimated. Obviously the five various 100 year design storms do not measure up to the underlying statistics, falling short over durations of 5 minutes to 2 hours - critical durations for urban drainage design. Because only local storm sewers are designed directly with IDF data and new system already has a major overland relief system in place, the value in updating IDF curves for new subdivision design is limited. Flood remediation studies rely on hyetographs. Typically systems are upgraded from 2-year or 5-year storm capacity to 100-year storm capacity, meaning a 100% to 150% increase. This gives a good benefit/cost as the most frequent flood events are prevented or mitigated, and therefore the most damages are deferred. Upgrading an old system further, considering possible climate change impacts to IDF curves that make design storms greater will yield a lower benefit/cost. This is so because the incremental increase in storm system capacity will not be used as frequently, and the incremental cost will be greater (as pipe sizes becomes greater, the sewer profile becomes deeper and in conflict with other services, subsurface utility relocations and restorations can also escalate - at greater depths, construction methods may become more costly (e.g., slide rails vs. trench boxes) to ensure worker safety, and dewatering (necessary for soil stability and construction safety) at the greater depths can add significant extras to project costs) - at greater depths, extensive dewatering can also introduce the potential for settlement at adjacent properties and damages - even if there are no damages, monitoring to document no settlement or damages adds to project implementation costs). 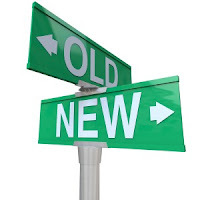 You should consider upgrading. Although observed extreme rainfall is not increasing in southern Ontario, and statistical trends in other parts of Canada are weak, runoff is increasing and overland flow paths are being compromised in many urban areas. Since we cannot restore lost rivers that used to take the flow, upgrading drainage systems is the most practical thing. Back in 1674 Pierre Parrault published “De l’origine des fontaines” which quantitatively related rainfall to streamflow in the watershed it falls in. It took almost 200 years for others to also conclude that the ratio of runoff to rainfall could be approximated as a coefficient (i.e., a fraction of the rain turns into runoff). And then a refinement in 1851 that has stood the test of time - Thomas Mulvaney presented to the Irish Institution of Civil Engineers that peak runoff rates are related to the response time of the watershed. And so for the last 165 years engineers have been using the rainfall intensity (the "I" in IDF) over the response time duration (the "D" in IDF) of a watershed to determine peak runoff flow rates by applying the Rational Method. What the "F" you say? "F" is for frequency, or the probability of achieving an intensity based on a probability distribution. Such distributions are calculated based on historical intensity observations that are fit to theoretical distributions. AN ECONOMIC ANALYSIS OF GREEN V. GREY INFRASTRUCTURE - Robert J. Muir, M.A.Sc., P.Eng., Fabian Papa, M.A.Sc., M.B.A., P.Eng. Is Wild Weather and a New Normal for Severe Rainfall Responsible for Urban Flooding, or Urbanization and Hydrologic Stresses? Case Law Points to Urbanization Driving Runoff and Flood Effects. Are Six 100 Year Storms Across the GTA Rare Over a 14 Year Period When Considering Probabilities of Observing Extremes at over 150 Rain Gauges? Environment Canada Report Confirms No Overall Change in Extreme Rainfall - Generally Random Ups and Downs - Stated Certainty of Future Shifts Contradicts American Society of Civil Engineer's "Significant Uncertainty"
Lost Rivers and Urban Flooding - Review of Flood Risk Factors in Toronto Wards 13 / 14 - Decreasing Extreme Rainfall Trends, Increasing Urbanization and Intensification. Financially unsustainable green infrastructure. Overland flow risk showing historical basement flooding areas.